Waco Mom: Do Fishes Get Cold In the Snow? Do Fishes Get Cold In the Snow? 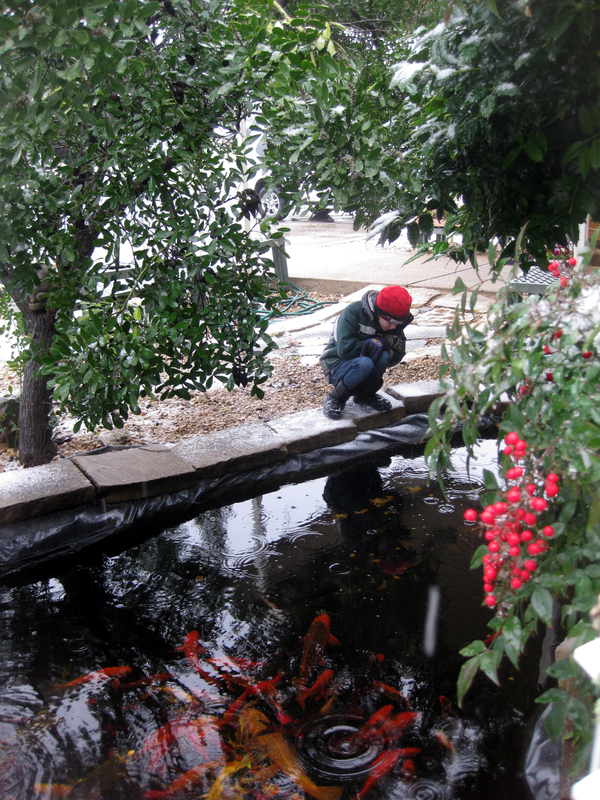 My youngest and I went to visit the fishes at Barrera's this morning, while we were out romping through the snow. My son wanted to know if fishes get cold. I'm sure they do...they were all huddled up on the bottom in one corner of the pond...and didn't come up to the top to greet us like they usually do. It's times like these I'm really glad I homeschool...well, at least one of my children. My other two were in school when the snow hit. After taking a walk out in the white stuff with my youngest, I hemmed and hawed about whether to go get them out of school. I finally looked at the weather and it said it would get warmer later so I got my youngest re-bundled and got in the car. It was still snowing when we left, but half way to their school it started to rain. Alas, no point in them missing a day to play in slush, so we turned around. But, they tell me they at least got to get out in it for a few minutes. At the intermediate school the whole school got to go outside for 10 minutes first period. The elementary school stayed in side for recess (Ptttth! ), but during library time the kids were taking pictures through the window, and the librarian had pity on them and let them go outside for a few minutes...though they didn't get to play in it, my son tells me. I really wished I had come and got them as soon as the snow started. So, what did you do in the snow? Did you get a chance to enjoy it? I liked it YESTERDAY, but now I HATE it. $10 to Spend at Educents - FREE!